Quietly and carefully, Hendrick Arents pressed black caulk between two boards of the hull of the ship Jolly Piper. Whenever a leaky ship sailed into Briel, his home town, everybody in town knew that Hendrick was the man to fix it. Not very old, not very big, Hendrick Arents was already one of the master carpenters in the Briel shipyard. Everybody who knew him, admired him. 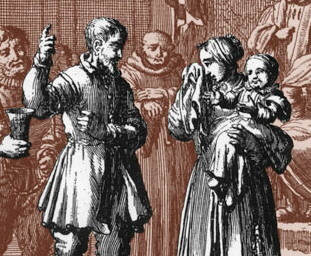 Though many suspected he was a member of the outlawed Anabaptist church, they somehow all decided not to tell the police about him. Today Hendrick was at work because the waves of the sea, pushing against the Jolly Piper during its long travels, had loosened a seam in the hull. By the time the third mate noticed it, under the deck, water was trickling into the ship, an inch deep. When the captain found out, he grumbled angrily and ordered the ship be sailed to the nearest port for repairs, which happened to be Briel. The third mate stayed below the deck, pumping water the rest of the way. He was grumbling too, but not as loudly as the captain. He didn't want the captain to think he was grumbling at him. That wouldn't have been safe. Ship repair was important work. The joints of a chair need to be tight, or they might fall apart when you sat on it. Hendrick could make a chair. But if the joints of a wooden ship aren't tight, and fall apart before the crew can get help, the entire ship could be lost: crew, cargo and all. Many ships sailed with their own carpenter, just for that reason. Hendrick understood that. He understood wood too. When faced with a rotten board, he could tell where the rot started and ended. Sometimes, as he was doing now, Hendrick had to do his work with water seeping all around. If there was time, he would rather have the ship in drydock, out of the water. But for some reason, the dark-eyed captain wanted his ship to stay offshore. To repair the ship, Hendrick had to row out to it from the dock. Another problem with leaks: even if a ship didn't sink, the lost speed and time might make them fall prey to pirates in a faster ship. Pirates, thieves of the sea, waited miles from shore until a ship came by, loaded down with rich cargo. The pirates would pretend they were friendly to the other ship, even pretend they had some letters to give them. But when the two boats came close, the pirates would shoot their big cannons until the other crew gave up. Now the pirates could take over the helpless ship, steal its cargo for themselves, and make an offer to the crew members: join the pirates or be killed. Hendrick had helped repair several ships that had barely escaped the pirates. One plank, he remembered, was so weakened by a pirate's cannons that it shattered when Hendrick tightened a clamp. Only by the grace of God had that ship not sunk before making it safely to the shipyard in Briel. Hendrick knew that only by the grace of God had he not been questioned by city and church leaders about his faith. So far, he was still able to live and work safely in Briel. 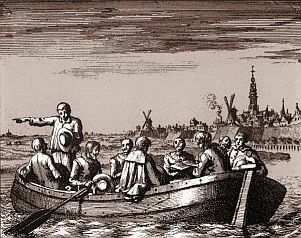 In other cities, even in nearby Rotterdam, many of his fellow Anabaptists had already been put in jail and killed because they wanted to live for God, and had been baptized to show it. And yes, many people in Briel were sure Hendrick was an Anabaptist. The way he worked, the way he talked, the things he did and didn't do: most people didn't live like him, but many wished they could. As Hendrick cleaned away the loose wood on the Jolly Piper, the impatient third mate was still pumping out water. Hendrick sensed the captain also wanted him to hurry, as he watched Hendrick apply the chisel and tar. But the tall, straight captain made no effort to rush the work. He seemed to be filled with such a desperate urgency that his face, hands and feet were quieted in concentration. Hendrick wondered what the captain was thinking. "Have you had safe travel?" Hendrick softly asked the captain, to pass the time for both of them. "I fear the winter storms will be worse because of the warm fall we've had." The captain nodded slightly. "I am told that, only last month, a merchant ship from Rotterdam, the Silver Stag, was attacked by pirates. They got away only because their hulls were empty and they could sail fast, or the pirates would have overtaken them," added Hendrick, looking up briefly. The captain's eyes glared at Hendrick, sharp as the sword at his waist. If possible, his gaze became sharper the longer he stared. Hendrick quickly turned back to his work. The captain said nothing and at last climbed the ladder back to the deck. The third mate followed him. Hendrick kept on caulking in silence. The plank had begun to split for almost four feet, and he needed to patch it all. But Hendrick had only finished half of it when the silence was burst by the boom of a cannon. Hendrick breathed a prayer as he worked. A second cannon blast, shaking the other end of the ship. He didn't stop praying. As Hendrick smoothed over his caulked seam, his heart thumping, he heard shouts on the deck above his head. He heard the captain now, almost screaming, the hard thumps of the crew's feet, and a huge bang, now much closer, this time from the Jolly Piper's own cannon above him..
What could be happening, thought Hendrick? They were less than a mile from the shore. Would pirates dare to come so close? Was it a war? Who was attacking them? At any rate, Hendrick knew where he belonged, in the hull repairing a leak, and he asked God to help him stay there. But now the third mate was back, almost tripping down the ladder, gun in hand. "The captain wants you on the deck, now!" the mate yelled, fear grabbing at his throat. Hendrick scurried back up after him. The captain was waving his arm in the sunlight and howling at a sailor, "Raise the anchors! You fool, why can't you raise the anchors?" Seeing Hendrick, he pushed him toward the cannon. "Bring another cannon ball to the gunner!" he ordered. Hendrick paused. "I can't, sir," he answered, respectfully. "Why not?" the captain screamed again. " I'm paying you to work for me, now fight for me. Quickly!" And he gave Hendrick a frantic shove as another blast made the decks of the Jolly Piper creak. "I'm a Christian, sir," replied Hendrick when he recovered from the push. "My Lord Jesus Christ does not allow me to fight with the weapons of this world." Now the captain howled again, crying out like a wolf. Ignoring Hendrick now, he ran to the railing to get a better look. Hendrick saw the ship that was attacking them for the first time. To his surprise, it was not a pirate ship. By its flags, it was a warship manned with soldiers from the neighboring city of Rotterdam ­ and they wanted the Jolly Piper to surrender. But why? Before long the crew raised a white flag and the shooting stopped. The captain, half crazed with his own image, realized at last he couldn't win a battle against the soldiers of Rotterdam. In a few minutes, the attackers had thrown a rope ladder up to the railing of the Jolly Piper and were coming aboard. The sailors waited on the deck, their heads hanging bitterly. The captain stood silently in the midst of them. Hendrick was on the other side of the mast, where he had been since he first came on deck. The commander of the soldiers boarded the ship, and in stern tones, announced, "By order of the City of Rotterdam and in the name of his majesty the Duke of Parma, you are under arrest for the crime of piracy, for attacking one of the merchant ships of our city, the Silver Stag, last month," Hendrick glanced in amazment at the tight-lipped captain, glaring into the sea. The commander continued, "for seizing the cargo of the Glory of Flanders in August and for killing her entire crew." Hendrick shivered as he realized what kind of people he had been working for, without realizing it. The Jolly Piper was a pirate ship! The soldiers began to put all the crew members into chains. When they had almost finished, one of them saw Hendrick near the mast. The soldier picked up a chain and walked toward Hendrick. Hendrick tried to explain that he was only there to caulk a joint, but it did him no good. Anyone on a pirate ship, working for pirates, was suspected of being a pirate. So Hendrick found himself chained to the mast with the othe sailors, on his way to Rotterdam. 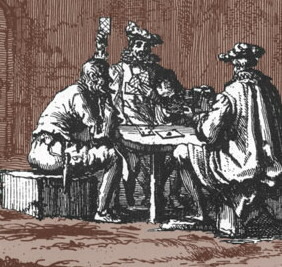 The next day, Hendrick and the pirates were standing before the seven judges of Rotterdam, in the town hall. He knew that in that same spot, many of his fellow Christians had already stood trial as Christians. "But not as pirates!" Hendrick thought with dismay. 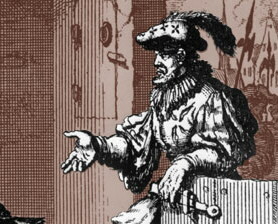 The commander of the soldiers was telling the judges about the battle, how one of the crew members from the Silver Stag had recognized the Jolly Piper and sent word to Rotterdam, how the pirates had stolen and killed for years without being punished. Hendrick had no chance to say a word, and no time to prove he was not a thief and a murderer. At last the chief judge announced them, "I hereby pass the just sentence of death upon you all. Do you have anything to say?" The captain and the crew looked down. There was not anything they could say. But Hendrick stood to his feet and said, "Is this a city of justice or violence? Why do you condemn the innocent with the guilty? I have not committed any crime." The judges looked at him as if he were a fool. Some smirked with pride. "Why should we believe you?" asked one of them. And why should they, thought Hendrick. They don't know me. They won't believe me. Dressed in my dirty work clothes, I don't look any different than the real pirates. I can't say I've never stolen, I can't say I've never wanted to kill. I can't even say that, five years ago, I wouldn't have fought when I was attacked. The only difference in me now is Jesus Christ. Jesus said, "When you are brought before judges, don't worry about what you will say, because the words will be given to you." And in the hour, the right words were given to Hendrick. "I am a citizen of Briel. I was hired to come on board to patch a leak, never realizing pirates were paying me to do it. But if you would ask my neighbors about my life and my faith, you would know what I am saying is true," answered Hendrick quietly. "Will you swear by the holy altar that you are not lying?" a judge inquired. "My words are honest. I am innocent of any piracy." "But will you swear?" the judge insisted. His palms sweating, Hendrick realized he could not do what Jesus had forbidden. "Jesus said to let your yes be yes and your no be no." he explained patiently. "Isn't that enough for you? May I be punished as a liar if I speak anything but the truth." His words got their attention. "What sort of person is this?" asked the governor, peering more closely at Hendrick. "Can he be one of the Anabaptists? Because if he is, he will not be executed as a pirate, but as something worse." "I believe the gospel of Christ, as I ought to believe," replied Hendrick, his courage wavering a little. "The gospel!" said one of the judges. "Ask him if he carries a New Testament with him." "Do you?" asked the governor. "Yes, I do," answered Hendrick honestly. The judges began murmuring. "That proves it," said one. "Only an Anabaptist would do that." "You were baptized as a baby, I take it?" asked a judge. "I don't remember that far back," replied Hendrick. Several people in the courtroom laughed. "And have you been baptized again?" queried the governor. This was the moment of truth, and Hendrick felt the Spirit of Truth rise up within him. Suddenly, his boldness returned -- no, he had never felt such boldness in his life. "No, I have not been baptized again," he said. "I was baptized once rightly, when I believed, four years ago." "Put him back in jail," announced the governor. "We will deal with him later." As the judges left, two officers grabbed Hendrick and took him away. For two weeks, priests and judges from the state church tried to make Hendrick believe what they wanted him to. Hendrick hadn't had the chance to learn the Bible very well, but he found that, once again, the words were given to him. The soldiers hurt him over and over, trying to make him change his mind or to tell them the names of other brothers so they could arrest them too. At times he thought he would give up. But every time, when his strength gave out, God's strength came in. And he never allowed himself to displease God with what he said.. Finally, Hendrick was sentenced. But not to death. He was sentenced to work on the Spanish slave ships. These long vessels moved even with no wind because dozens of prisoners at the same time pulled giant oars to push ahead. Their Spanish masters gave them only enough rest to keep them from dying, but if some died anyway, the Spaniards didn't worry much about it. But, worse for Hendrick, these were warships, with which the Spanish soldiers had conquered many nations, including his homeland. Hendrick would be rowing into battle, cannons booming, helping the Spaniards to kill their enemies. He was sure that if he refused to go, he would be beaten until he died. God had made him ready for death, but Hendrick prayed that he would be spared from this. To lead Hendrick to the slave ships, the judges of Rotterdam hired an evil little man named Smuel. Smuel had often been in jail for his crimes, but right now he was out, and needed a job. The judges chose Smuel as a guard because he was tough, and they were right about that. Hendrick had to walk miles with Smuel beside him belittling and mocking the Anabaptists, as if the guard had the right to make fun of those who knew God more than he did. "So, you think that you are wiser than our teachers?" he taunted Hendrick as they traveled. "Being sprinkled as a baby wasn't enough for you, eh?" Hendrick didn't answer. Jesus warned not to give pearls to pigs. Not that Smuel was a pig, but Hendrick didn't think talking about it would bear any fruit. "And they tell me that you people won't fight," Smuel continued. "Are you scared, or just too weak to do it? You're sure in for a surprise when you get where you're going!" Hendrick said nothing. He knew that if the thousands of Anabaptists wanted to use swords, they could have freed him from prison. But that wasn't the Lord's way. Finally, as the sun began to set, Smuel decided they would spend the night in an inn. First, he wanted to get a little something to drink. Walking always made him thirsty. Hendrick knew what was really on Smuel's mind. The guard had a jug brought to his table, and filled his mug over and over. As he became more drunk, he became more cruel to Hendrick. Finally, he dragged his prisoner upstairs to their room for the night. He locked the door to keep Hendrick inside. Then he fell onto the bed, overwhelmed by the alcohol. It was Hendrick's first quiet moment all day. Sitting in the room's only chair, a splintery chair, he began to pray, thanking God for saving his life so far, and for making a way to Heaven when his life was over. Somehow, he felt more of God's presence since he had become a prisoner. But he too was tired, and after a while, he lay down on the wooden floor and went to sleep. Hendrick was awake before the sun rose. Dim light entered the room through the crack of the door. But this morning, the crack seemed wider. Quietly, Hendrick rose to test the lock. It was firm, but the door itself swung on its hinges. Smuel had locked it but failed to latch it. And in that simple act, Hendrick realized God was rescuing him from the slave ships. He glanced again at Smuel, who couldn't still hear or see a thing. And wouldn't, for several more hours. Hardly believing it, but praising God for it, Hendrick quietly opened the door and went downstairs. Hendrick expected the door to the inn would also be locked, but when he reached the main room he found it open, as two big travelers hefted wooden boxes to their wagon outside. Strong as they were, they already seemed tired to Hendrick. They must have come into the inn after Hendrick went to bed, and hadn't heard Shmuel boasting to everyone that he was taking an Anabaptist to the slave ships. "Need a hand?" Hendrick asked, wondering why an escaping prisoner would be thinking about someone else's needs, but feeling God in it. The larger man grunted. "Since my two helpers decided to wait for easier work, I need all the hands I can get today. I'll pay you fairly, and more," he said. "Where are you going?" asked Hendrick, lifting a crate to his shoulder. "Rotterdam, to a warehouse near the docks," the foreman replied. "How about you?" "I hadn't planned to go so far," answered Hendrick hesitantly, remembering what happened the last time he was in Rotterdam. "Fine," the foreman rumbled cheerfully, "I can find men enough to unload me when I get to Rotterdam. But I could use your help along the road, as much as you can give me." And so Hendrick left the inn before sunrise. By the end of the week, he was safe at home again in Briel. God preserved Hendrick Arents' life for many years. At last he died in peace in his home town, his children and grandchildren around him, faithful to the end.